Satoshi and the friends walk towards Wakaba Town. 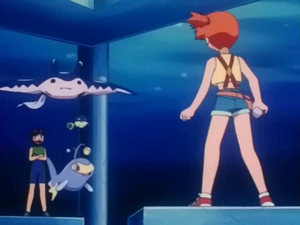 The group comes at a beach to witness the sea and Kasumi sends out her Water Pokémon. 02:53 Movie 1 Short - Yadon Eyecatch After the group reads a sign about a synchronized swimming event, Takeshi imagines it being filled with pretty girls in bathing suits performing alongside the Pokémon. 03:30 Movie 1 Short - Yadon Eyecatch Takeshi fantasizes about the Hanada Gym Leaders participating in the swimming event. 03:43 Hanada Gym - Swimming Ballet The music plays through loud speakers, as the synchronized swimming event begins with a boy being the only human, to Takeshi's disappointment. Nyarth's boss fantasy: Sakaki jumps into a water pool and relaxes with the Water Pokémon Rocket Gang is trying to catch. Ryuji gives the group a tour to his unofficial Gym. 07:33 1997-1998-M26B Rocket Gang swims underwater inside their Koiking sub. 07:49 Movie 1 Short - Coil Eyecatch A Mantain, a Harysen and a Lantern attack Rocket Gang's sub and soon break it, flooding its inside. 08:26 Movie 1 Short - Madatsubomi Eyecatch The group and Ryuji spot Rocket Gang's sub being attacked by the Water Pokémon. Japanese (Trans): Run Away, Run Away! Satoshi and Ryuji use Waninoko and Lantern, respectively, to attack and blast off Rocket Gang. Movie 1 BGM - Satoshi battles Ryuji. Kasumi is about to begin the battle against Ryuji, but Koduck comes out and stops it. Kasumi battles Ryuji's Harysen with Tosakinto. 13:37 Movie 2 BGM - Fire Orb Movie 2 BGM - Kasumi sends out Sunnygo against Ryuji's Mantain. 14:00 1999-2001-M38 ~OK!~ (BONUS-TRACK) Who's that Pakémon? Tosakinto! 14:12 Movie 2 BGM - Legendary Birds Freed Movie 2 BGM - Kasumi's Sunnygo battles Ryuji's Mantain (the music starts close to the halfway point). Rocket Gang interrupts the battle with a Motto Variation. Rocket Gang starts sucking everyone into the mecha. Satoshi and Takeshi arrive to rescue Kasumi, Ryuji and the Pokémon. Satoshi, Kasumi and Ryuji reunite with their Pokémon. The latter two then talk about each other's qualities. After that, the group says goodbye to Ryuji and heads to Wakaba Town.